White Monkey Guesthouse i Phetchaburi, Thailand: Reservér nu! 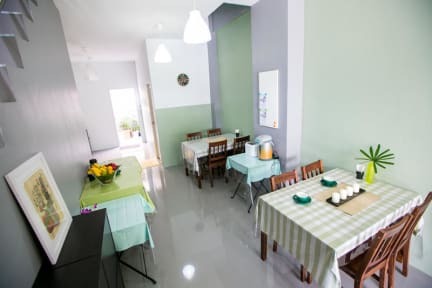 White Monkey Guesthouse is located in a peaceful 'Khlong Krachaeng' street in the city centre of Phetchaburi, within 5-10 minutes walking distance to Wat Mahathat Worawihan, and Phra Nakhon Khiri Historical Park, the city’s landmark. Many famous food stall are easily found in this area. The guesthouse is just 10 minutes walk from two main bus stations and 15 minutes walk from train station. White Monkey Guesthouse offers 12 clean and well equipped fan and air-conditioned room with free wifi in room and breakfast.